Stevenson Brothers Rocking horses are manufactured for todays market. They may sometimes be available for sale preloved, through this site. The Stevenson brothers Marc & Tony Stevenson learnt their craft of making rocking horses from their uncle James Bosworthick who was himself a rocking horse maker. Their business was born in 1982 and is still a continuing concern. Their horses come in a variety of styles from traditional dapple grey to wood types & finishes & some are bespoke creations including unicorns & zebras. These rocking horses do find there way on to the rehoming market & it is worth keeping an eye on the 'rocking horses for sale' page & bookmarking this site for updates. If you are looking to sell your Stevenson Brothers rocking horse & would like assistance please click here. Wanted adverts can also be placed. 'Contact Us' for further information. Crafted to commemorate the Queens Golden jubilee, this particular horse bears the Queens racing colours on its saddle cloths & a gold plaque with unique serial number. These horse were to a limited edition of 50. It stands on a coach style spring stand which gives a bouncier rock than that of the standard swingstand. Another type of rocking horse in a dapple grey finish & made by Stevenson Brothers, but this time on a standard swingstand. 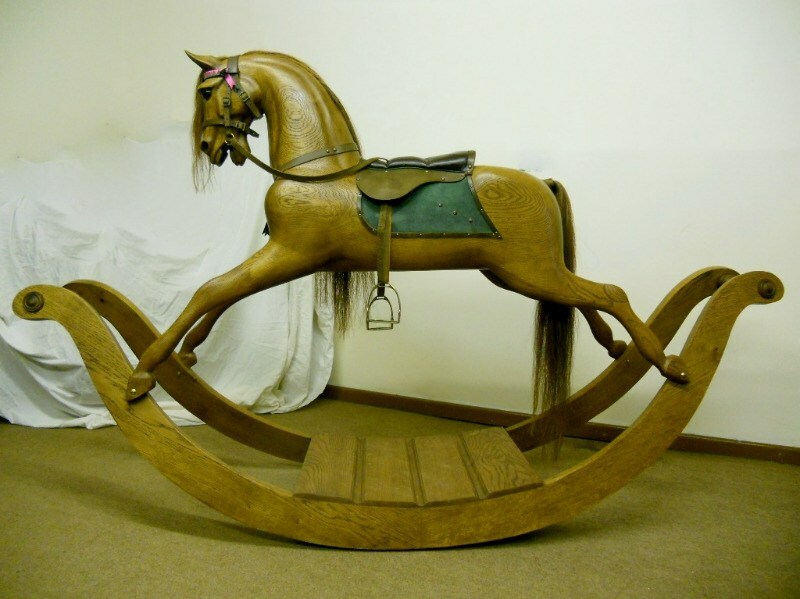 This particular model is a replica of the victorian F H Ayres rocking horse extra carved. You can just make out the plaque on the front of the stand. 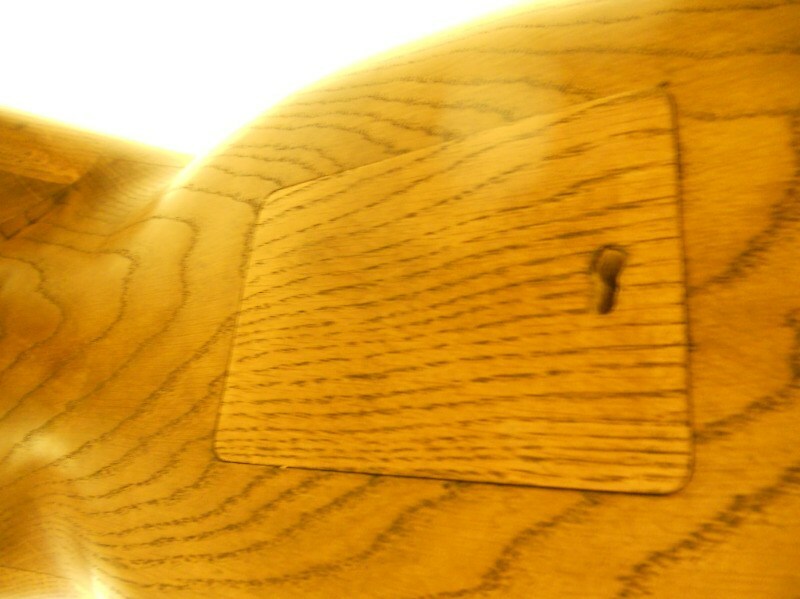 Here is another example of the type of rocking horse finishes that the Stevenson Brothers made available for sale. This particular horse is a bespoke wooden model with a removable bridle. 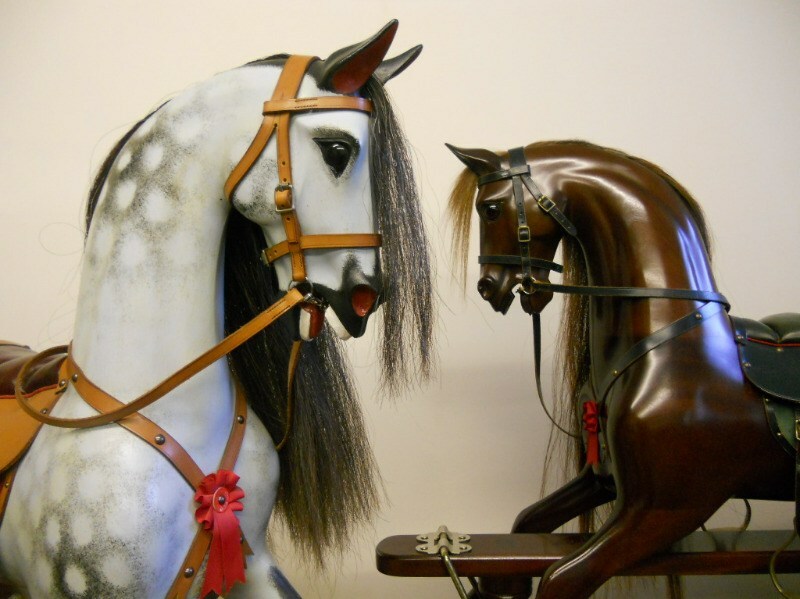 These two horses, the traditional dapple grey on the left & the Mahogany wooden rocking horse on the right are both by the Stevenson Brothers. Note the similarity in the carving style. Some of the Stevenson Brothers rocking horses have been fitted with a secret compartment under the tummy of the horse. This would be opened & locked with a key which would be fitted securely under the saddleflap of the rocking horse when not in use. Stevenson Brothers rocking horses have a definate carving style to them & some of their early period models are exquisite. Take note of the saddle cloth which is trimmed all round in leather - just one of their identifying features. They also finish the rsaddle cloths on the rocking horses that they restore in the same manner. This is just one example of the type of plaque that the Stevenson Brothers would have fitted to their earlier rocking horses. Often fitted to the front of the swingstand. The bow rocking horses would have them fitted to the front section of the deck between the bows.